This is the seventh interview of the « Ux & Journalism » series. Alexandra Schmidt is UX Designer. Before, she worked as a journalist. Cette interview est la septième de la série « UX & Journalisme ». Retrouvez les autres dans la catégorie éponyme. Alexandra Schmidt est UX designer et fut journaliste auparavant. /! Interview en anglais uniquement. What’s UX Design for you ? It’s a method of design that I think will soon become « the way design is done ». It will lose it’s specialness and will became standard operating procedure. How did you become an UX Designer ? I worked in tech on and off for years, but was primarily a public radio reporter. I was freelancing for a few years, and an opportunity to do a 2-day a week paid UX internship fell in my lap. Since I was freelancing at the time, this was no big deal for me. I did the internship, and a few months later, I was hired. What is the best way to become one ? Probably take a course at General Assembly. I have many colleagues who did this and they say good things about GA. I also think these colleagues are smart and talented, so I think highly of the course as well. Is UX more « a process or a task » ? Probably more a process, but there are « tricks » or « tasks » (taken from many other fields — card sorting or a user survey) that are part of it. Can we say UX Design is present in online journalism projects ? I’m not sure. I haven’t worked in the tech team of a journalistic outlet lately. My guess would be that journalistic tech groups are lagging behind because they usually do not have enough resources to keep up. For you, how can UX help/contribute to journalism ? On which kind of projects ? To me, I see UX being applicable to journalism in the idea that journalism outlets can and should better under their audience. I think journalists have been protected against understanding users for a few reasons. Reason one is the understandable concern that editorial judgments could be clouded by business considerations (the well known newsroom/marketing « firewall »). Reason two is that, before the Internet, news outlets had untouchable ad revenue and audiences too. These things were guaranteed to be in endless supply because there were a limited number of mass media outlets. So journalists were in a bit of an ivory tower and had no need to look outside of it. Obviously b/c of the Internet there are now unlimited media outlets, so ad revenue and audience are no longer guaranteed and there are business pressures to better understanding audience. Reason three is that there simply was not the technical capability to connect with users. We now have online comments. We have online surveys. We have endless ways to understand, learn from and connect with our listeners/readers/watchers. So basically, to me, the biggest contribution of UX to journalism is the idea of reaching out to, better learning from and connecting with users. The idea of making journalism a collaborative process between journalists and audience. Do you have a specific example of collaboration of an UX Design for a journalistic project ? I just filled out a survey that NPR sent out to users. So maybe you could see that as a mass media outlet using UX principles? But again I have not been in the tech group of a newsroom in a long time so I’m not sure. 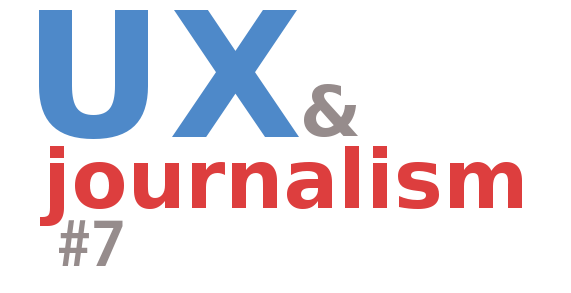 Partager la publication "Alexandra Schmidt : UX to journalism is the idea of better learning from users"